Astros RBI is a free summer baseball and softball league for boys and girls ages 13-18. The league has three (3) divisions: Baseball Junior Division (Ages: 13-15), Baseball Senior Division (Ages: 16-18) and Softball Senior Division (Ages: 13-18). League play will be from May 27 - July 14, 2019. All games are played on weeknights only at Sylvester Turner Park. Tryouts dates for baseball and softball divisions are: May 4, 7-9, 11 14-16, and May 18 (This date is only for players in HS playoffs that can not make previous tryout dates). Players will only need to tryout on ONE of the specified tryout days. Players WILL NOT be allowed to tryout more than once. Players can attend ANY one of the listed tryout days. Additional information may need to be filled out on the day of the tryout. Baseball and Softball Players in each division will be notified of selection by e-mail on May 21-23, 2019. Astros RBI BASEBALL Tryouts - Junior Division (13-15) - Must be born between May 1, 2003 and April 30, 2007. Per RBI rules players CANNOT play up. Astros RBI BASEBALL Tryouts - Senior Division (16-18) - Must be born between May 1, 2000 and April 30, 2003. Must be born between May 1, 2003 and April 30, 2007. Per RBI rules players CANNOT play up. Must be born between May 1, 2000 and April 30, 2003. 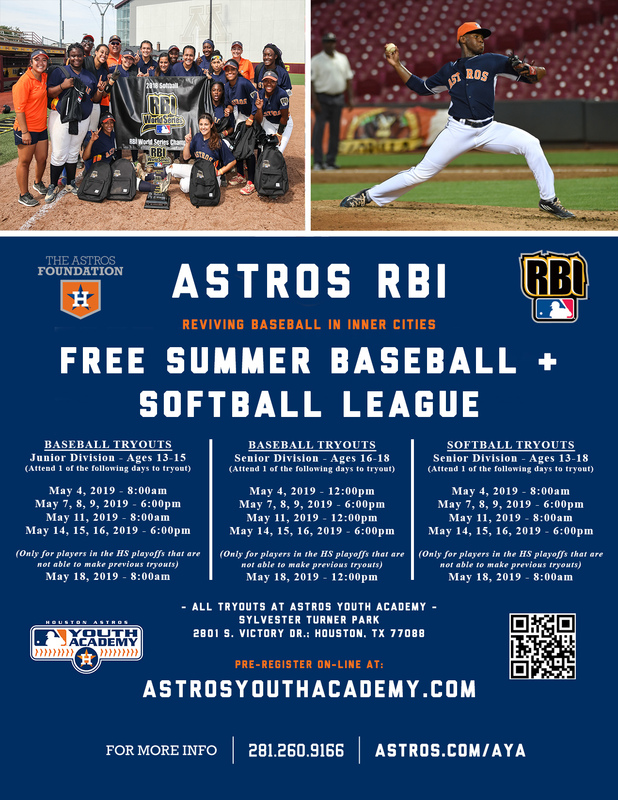 Check out this Baseball/Softball/Tball league '2019 Astros RBI Summer League At Sylvester Turner Park (Ages 13-18)' with Houston Astros Youth Academy (AYA)!